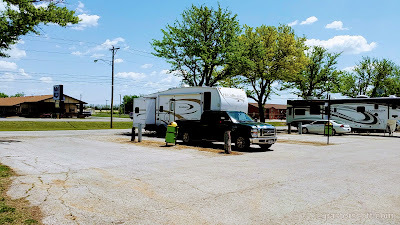 We’ve spent a couple of nights at Santa Fe Safari Campground in Chanute, KS as we prepare to drop our 5th wheel off for service at NuWa. These are the folks who made the camper and we are looking forward to having a couple of things repaired on it. Just a few minutes from the manufacturer’s service department is this nice city campground. My guess is that over half the RVers who come to this city campground are here because of NuWa service and sales. No one can argue with the price: free for the first two nights, then just $10 a night after that. The campsites are basically parking lot sites with 30/50 amp electric and water. There is a dump station on site. This city campground even offers free WiFi! There are two sections. The east side is closest to S. Santa Fe Ave. and has all pull through sites and has the good WiFi signal. The west side sites are all back in and are close to restrooms (not well kept) and beyond the range of the WiFi. However, the sites are a bit wider and longer. They are also close to the dump station. We spent one night in the eastern section and then moved to a back in spot so we could stay hooked up and be ready to report in to the service center early the next morning. Some of the pull through sights are are just barely wide enough for two RVs. 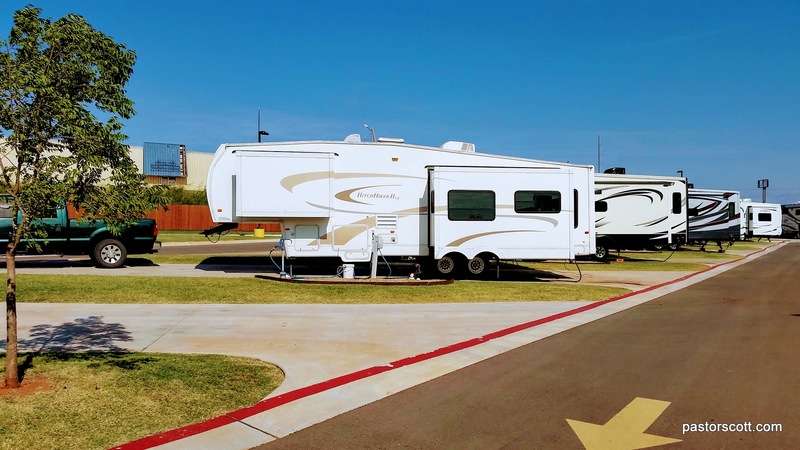 People who are trading RV’s park the two rigs “face to face” so they can more easily move their belongings to their new digs. This is perhaps the only time you’ll ever see a RVer happy to have another rig parked very close by! While Chanute isn’t exactly a tourist destination, this is a great small town campground for a great price. See individual photos with notes here. We don’t do many one night stops. Our lifestyle as fulltimers is shorter moves and longer stays. When we were vacationers we did the opposite: longer moves and shorter stays. However, there are always exceptions so once in a while we do a “shortstop” of just a night or two. In this case we’re taking our Hitchhiker to its birthplace in Chanute, KS for some long overdue repairs and just needed a spot to land for the night. One plus for us is that we have some long time friends in Tulsa and we enjoyed some time with them. 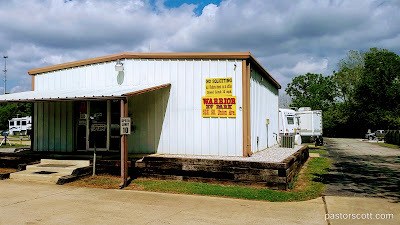 All of that to say we did a one night stop in Tulsa at Warrior RV park. Really, it’s a nice place for a short stay; located right on I44 and near Hwy 75. This is an older park, mostly pull-throughs. Our site was barely long enough for pickup and hooked up camper. All the connections are at the back of the site so I had to get out an extra water hose and add a sewer hose connection. The water connect is underground. I had to get down on my knees to connect the water hose. The owners are friendly and accomodating. I asked about parking and they directed me to some nearby sites that they didn’t expect to use and told me that any of them are fine. They also offered to help me hook up the water if I was having trouble getting to the spigot. Yes, you can hear the traffic, but when you pick an RV park beside an interstate you can’t expect much else. The restrooms are older. When we were there they needed cleaning, but it looked like the need was the result of recent activity. Our Verizon signal was good, campground WiFi worked fine, and I had no problem getting a satellite TV signal. If you are visiting Tulsa and need a spot or traveling across Oklahoma and just want a stop for a night or two, this is a good place to land. Roadrunner RV Park in Oklahoma City, OK gets good reviews and we agree. While this is no tranquil, picturesque campground it is a clean, efficient, well-planned urban RV Park. The roads are good and the campsites, while not spacious, are big enough. Most sites are pull through spots that, again, are just long enough. There’s nice grass between sites and excellent utility hookups. The park has a new office and meeting space. The restrooms are as nice as you’ll find. We didn’t hook up to the cable TV but the WiFi performed well except for an overnight issue that was resolved the next morning. The campground even has new underground tornado shelters. The campground has recently expanded and with that expansion a new entrance was added. Access is now right off of the I35 north feeder road. Just watch for the big campground sign. This is, of course, Oklahoma City so there is both traffic and the noise it brings. There is also the convenience of being close to most everything. The price reflects the location, but, really we’ve paid more. If you need a spot in OKC, this is it.